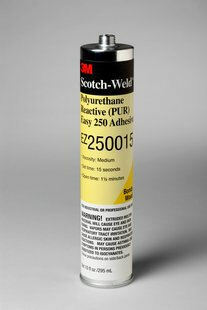 3M™ Scotch-Weld PUR Adhesive EZ250015 achieves extremely fast set time and is effective across a range of temperatures and ideal for bonding wood and select plastics. This one-component, 100% solids, adhesive provides fast handling strength. The fast-set formula is ideal for creating strong bonds with little to no clamping or fixturing. This adhesive is dispensed with our PUR Easy 250 Applicator.